We sailed into Porto (Portugal) and Emmie wanted to take some inspiration for some new pieces of work so quickly setup in a creative working space in the old town. 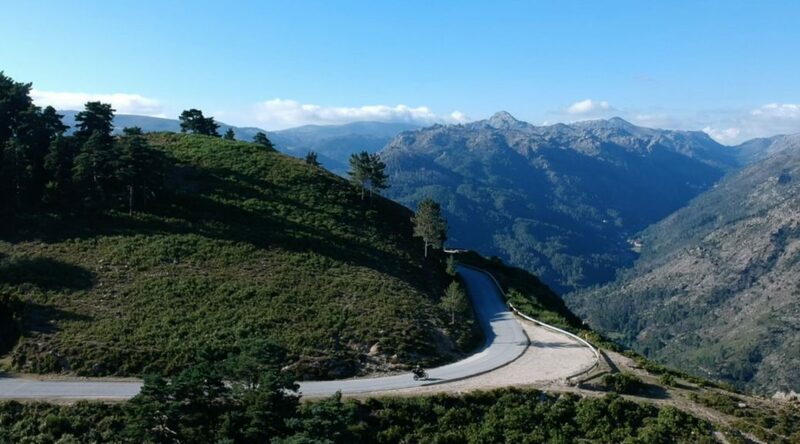 Meanwhile I rented a new Royal Enfield for a trip into the Peneda-Gerês National Park. The park is in the far North of Portugal bordering Spanish Galicia. It is a region of mountainous outcrops with a good population of Wolves, wild horses and historical villages with a history of barley farming. The route took me along the Douro River and then North via small villages and into the National Park. I cut through off road to the Santuary of Nossa Senhora. Every year, in the first week of September, several hundred pilgrims from all over the region and from neighbouring Galicia flock to this place of pilgrimage. The dedication to Nossa Senhora das Neves (Our Lady of the Snows) originates from the Middle Ages, spreading the legend of her apparition at this site, where a small chapel has been built. The present Sanctuary, built in the nineteenth century, is topped by a church with a monumental flight of steps. The route on bike was was approximately 50% road and 50% dirt with plenty of lakes, historical villages, swimming spots and lots of windowed ladies walking around dress in all black! The bike was a Royal Enfield Himalayan which is a half touring and half dirt bike but light weight and good for solo adventures were it can be maneuvered up small tracks and over rough ground easily.